Favorable reviews have also arrived from Kirkus. RRT reviewed my book as a Perfect Ten. Every town, every city, is built by everyday people, and Washington, D.C. is no exception. 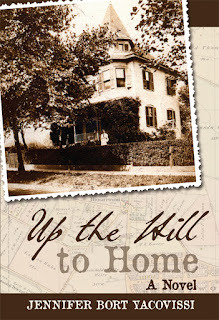 Anonymous, hard-working women and men form the backbone of the place their families call home: strong women like Mary Miller, who held her family together during the Civil War; Emma Beck, an inventor, career woman, and devoted mother; and Lillie Voith, whose dream of a large family was fulfilled by a tribe of nine children. They are matched by equally strong men, like Charley Beck, whose humor and wisdom served equally as glue and lubricant. These are my ancestors, and Up the Hill to Home tells their story over most of a century, as their faith and love, home and family, and strength of character contributed to building the nation’s capital, their hometown. 1. My laptop, a MacBook Air. 2. Two books I’m reviewing for Historical Novel Society. 3. A Christmas present from a friend in anticipation of my April book launch. It’s a gift bag labeled “Day 1 Supplies”, and it contains 60 Bic pens and a bottle of Aleve. 4. Two gargoyle bookends (which are holding up my research notes). 5. A fresh supply of Up the Hill to Home bookmarks. The best personal advice I ever got was from my mother, who told me that I needed to actively choose what I did with my life, and to guard against allowing it to simply happen to me. “Because before you know it, you’ll wake up one day, look in the mirror and say, ‘When did I get old?’ And you’ll realize you didn’t do what you wanted to do.” I didn’t practice her advice as fully as I should have, but I’m pretty happy with what I’ve been able to accomplish so far. I don’t often get a full day to write, so when I do, I try to start by 8:00 a.m. No matter where I am in the process, I make sure I have a plan of what I am going to accomplish for the day. One of my worst habits is to interrupt myself because something occurs to me that needs to be done but is not on task, so I try very hard just to write that down and get back to where I was. If I’m doing concentrated research that demands I make an onsite visit—for example to the National Archives or Library of Congress—I schedule an entire day to do that and make absolutely sure I have a research plan, including a list of the specific things I’m trying to find out. Otherwise I know I won’t stay on task! If I don’t have a full day to write, then any writing I do is perhaps a half an hour in the early morning or a few hours at night, often between 9 p.m. and midnight. I am attempting to instill in myself enough discipline to write everyday, but it hasn’t taken hold yet. It’s a shame that you need discipline to develop discipline. The first four would be Annie Proulx, Ann Patchett, Alice McDermott, and Anthony Marra, because 1) I love and admire their writing deeply, 2) I could only hope to have my writing style and ability compared to theirs, 3) they are my favorite writers writing today (not sure why everyone’s name has to begin with A for them to be a favorite of mine), and 4) because they are all still alive, it’s actually within the realm of the possible for that dinner to happen. The fifth would be William Shakespeare. Not only is he completely timeless, but can you imagine a better dinner companion? I don’t have to wonder about that, since my writing does not yet pay the bills. I own a small project management and system engineering company. After college, I started as a technical writer for technology companies. I’ve spent my entire career working with computer scientists and electrical engineers, and some of my proudest moments have been when customers I’ve worked with for a long time are surprised to discover that my degree is not in engineering but in English literature. This just proves my long-standing position, in the debate over the value of a liberal arts education, that my college curriculum taught me critical thinking, which I apply in my job everyday. While I’ve had a successful career, if I had a do-over, I would spend much more time focused on writing. Going back to that advice my mother gave me, while it’s of course important to make sure you can pay the mortgage, we all need to discover what it is that brings us joy. For me, that’s writing. 7. Finally….tell us how we can connect with you online. Jenny Yacovissi grew up in Bethesda, Maryland, just a bit farther up the hill from Washington, D.C. 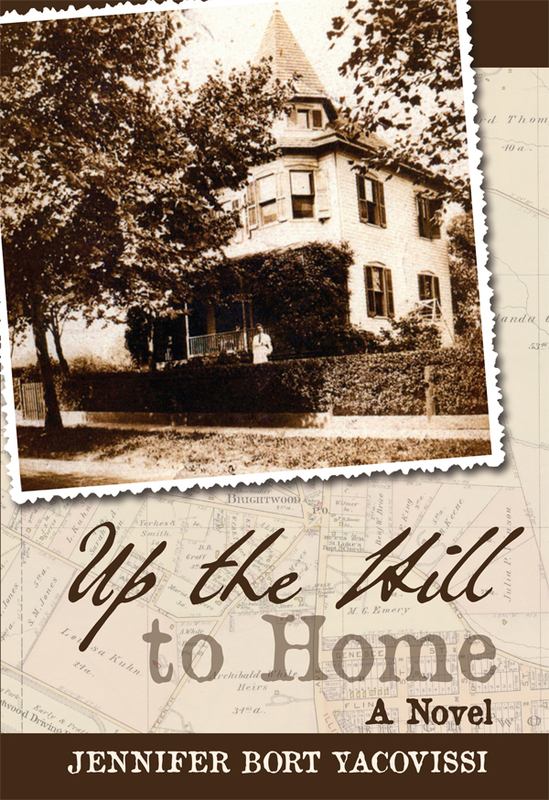 Her debut novel, Up the Hill to Home, is a fictionalized account of her mother’s family in D.C. In addition to writing and reading historical and contemporary literary fiction, Jenny is a reviewer for Washington Independent Review of Books and the Historical Novel Society. She owns a small project management and engineering consulting firm, and enjoys gardening and being on the water. Jenny lives with her husband Jim in Crownsville, Maryland. 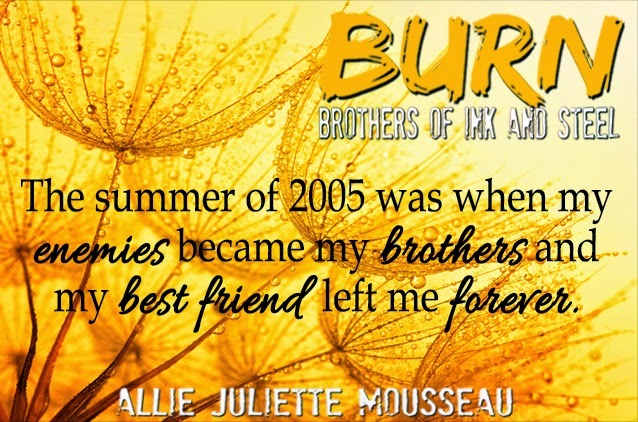 Promo Spotlight on BURN by Allie Juliette Mousseau!!! May 26th marks the release of the twelfth novel in my Against Series--AGAINST THE TIDE, Rafe Brodie and Olivia Chandlers' story, the third in my Brodies of Alaska. After writing for so many years, it's almost hard to remember how difficult it was getting my early books sold. I’m sure every author has an interesting tale of how he or she got published. In my case, my husband Larry had written an historical novel titled Shadow of the Mast set in early California, but he couldn’t find a publisher. 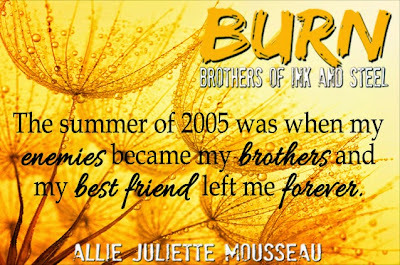 I loved the book, which was extremely moving and very romantic. I decided to see if maybe there was something I could do to polish it a little, maybe help it sell. By the time I was finished, I was hooked on the idea of writing a book of my own. I chose a western romance because I had a western background, and Magnificent Passage was born. Now both of us had books to sell, which we tried to do by attending conferences, looking for an editor who might be interested, and trying to find an agent. At a conference in Fresno, California, we met an agent who agreed to read sixty pages of any attendee’s manuscript. We sent the pages and the agent took both of us as clients. Unfortunately, those manuscripts were summarily rejected by every publisher in NYC! Despair set in. Picking ourselves up, we each started writing another book. Months later, the very last publisher my first manuscript had been sent to decided to buy it. Pageant Books made it the lead title for their new romance line, a great start for me. During that time, L.J. 's manuscript, his second western novel, Tenkiller, was sitting in the slush pile at Kensington where it had been for nearly a year. It was picked up, read, and purchased. After all the waiting, we were published six weeks apart, which meant we could travel and promote our novels together. The bad news was my first publisher closed its doors after just two of my books were printed and I was out on the street again. Again, I was rejected everywhere. Totally distraught, I was trying to bolster the courage to keep writing when, at the last possible moment, Berkley picked up my next novel, Captain's Bride, and again, the book was chosen as a lead title. Even after that, it was no easy road. Since those early days, I’ve written for nearly all the major houses. Some were a real pleasure, others not so much. Currently, Kensington is publishing my Romantic Suspense novels. In AGAINST THE TIDE, Rafe Brodie is the captain of a charter fishing boat fleet in tiny Valdez, Alaska. It's a majestic but harsh and remote place to live. Fascinated by the new owner of the Pelican Café, Olivia Chandler, Rafe begins to wonder why such a beautiful young woman would want to hide herself away in such a place. 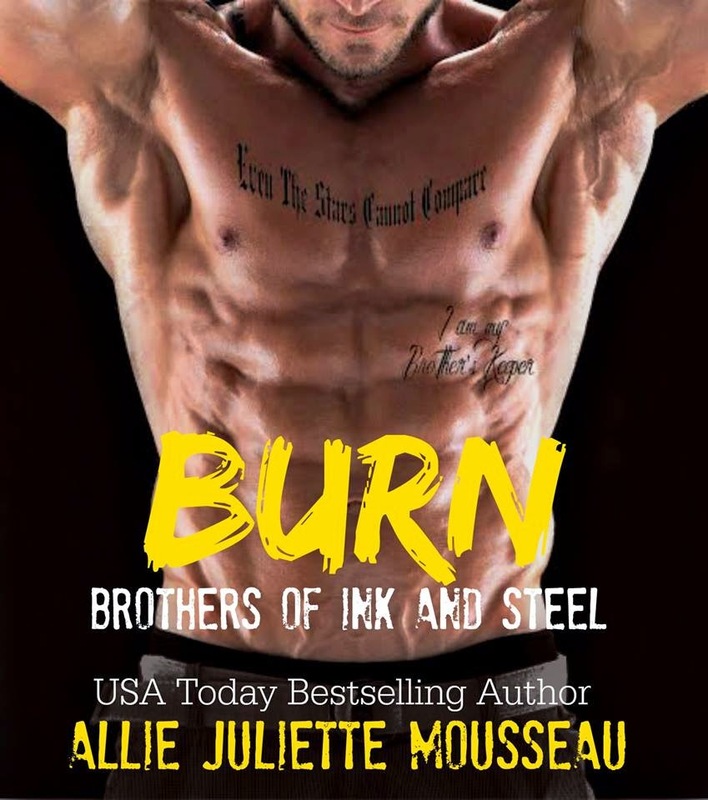 Rafe is determined to solve the mystery, but when his first mate, young Scotty Ferris, is murdered, Rafe has a far more important mystery to solve. Scott was Liv's friend, too, and she is equally determined to find his killer. 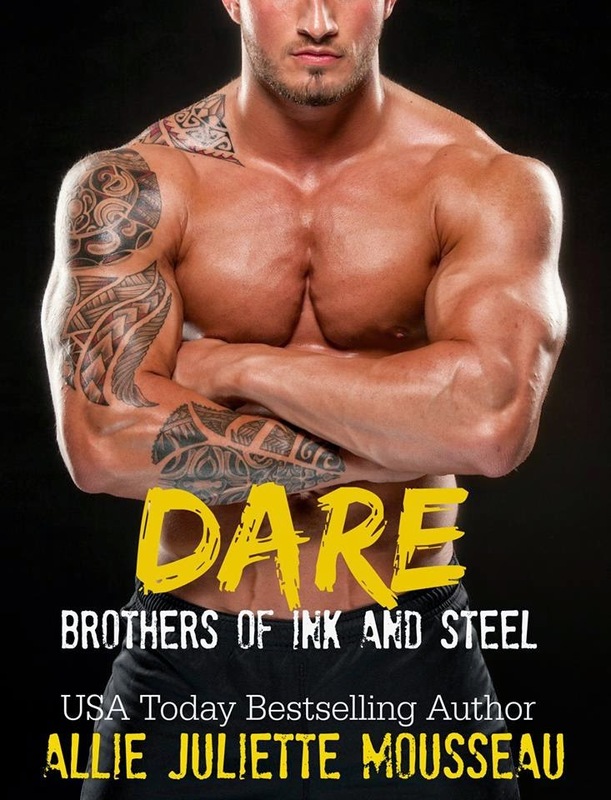 As the clues unfold, Rafe and Liv are drawn into a web of secrets and lies and that lead both of them into danger. I hope you’ll watch for AGAINST THE TIDE and if you haven't read AGAINST THE WILD and AGAINST THE SKY, I hope you'll try them, too. Liv Chandler is running for her life. She can’t trust anyone, not even the one man who makes her feel safe—rugged charter boat captain, Rafe Brodie. Rafe is determined to uncover Liv's secrets, but the beautiful café owner has a past more dangerous than Rafe can guess. Something terrible is coming…and even in remote Valdez, Alaska, Rafe can’t protect her forever. 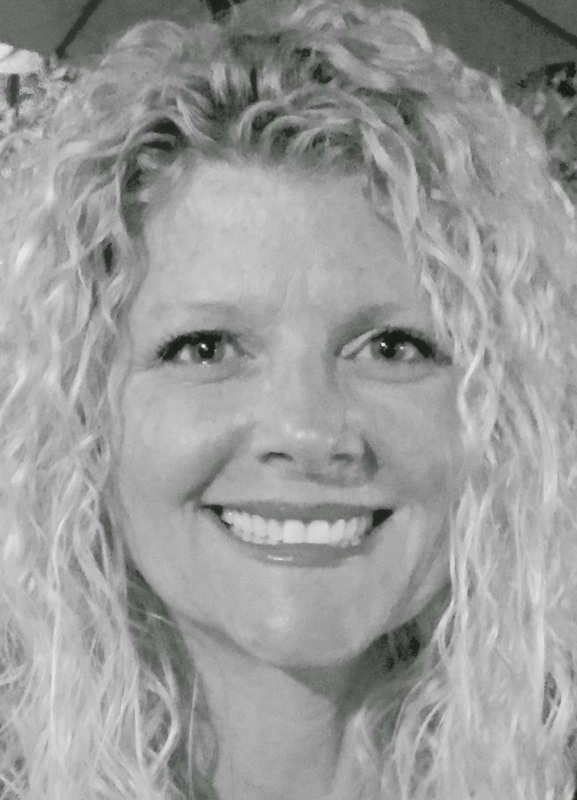 Chat Wed night with Joanna Shupe! Promo Spotlight on RIVI JACKS! 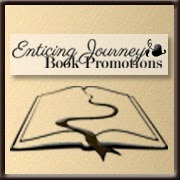 Promo Spotlight on Anie Michaels! Chat tonight with... VICTORIA ALEXANDER!